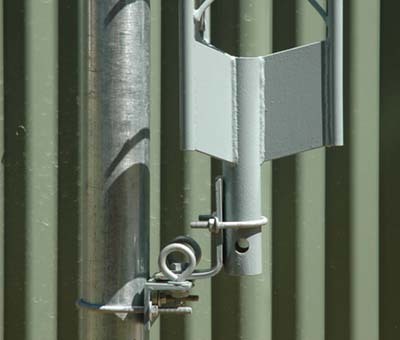 The radio mast, an almost fundamental component of any amateur radio station was in my case a compromise of a number of mental design aspirations and by the opportunity of the available hardware that could be acquired and fabricated. 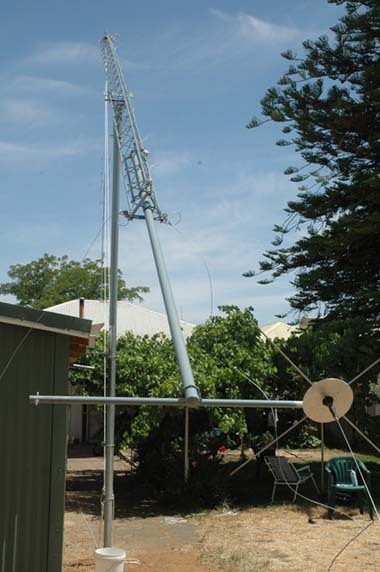 The amateur radio station's collection of antennas is for me a dynamic thing that will change and evolve over time, however if the mast is well designed it should require little modification. My first purchased was a 7.7mtr section of lattice tower advertised on VKHam. I had transported the tower to my home without having fully determined how it would fit with my plans. I had however formed a bit of plan that the mast could be a tilt over structure based on photos that I had seen on the internet without any detail of how these masts had been constructed. I contacted local ham Jim VK6CA for his thoughts on what was possible, Jim clearly saw the vision of what was needed to be done based several successful and less successful designs of this type that had been developed by him and others. The final design was for an over all mast/tower consisted of a 5.6mtr length of 80mm medium duty galvanized steel tube concreted 1mtr into the ground with a fabricated cradle assembles fitted to the top. 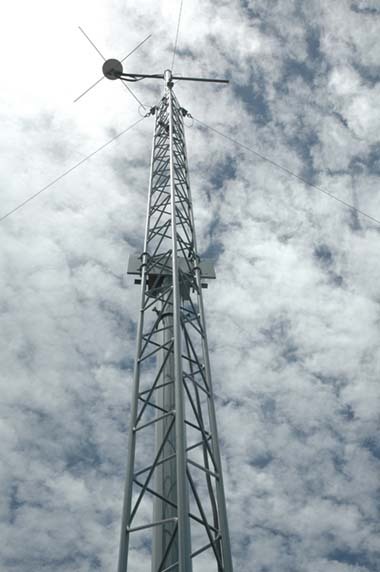 The lattice tower would have a fabricated steel bracket complete with a pivot rod attached just above centre height of the lattice tower, about the centre of gravity of the lattice tower. The rod bracket would sit in the cradle assembly held in place by the weight of the tower. The top of structure would now have a total height above ground of 8.3metres. Finally there wound be an addition 2.0mtr section of 40mm diameter galvanized steel tube attached to the top of the mast, achieving total structure height above ground of 10.3mtr. The mast is stabilized against high wind loading with three guy wires positioned approximately 120deg from each other. It is intended that at least one of the guy wires will be used as a multi-band radiator covering bands between 7 and 29 MHz. Swage connectors were used as part of the termination of the guy wires, these connectors allow the wires to be bridged from the mechanical termination and bonded to the mast for example. The 3mm swage connector is marine grade attachment for small size wire rope from Zenith, Cat WSS203; a malleable elongated plated copper sleeve that produces a neat, quality electrical connection with an acceptably strong physical connection. 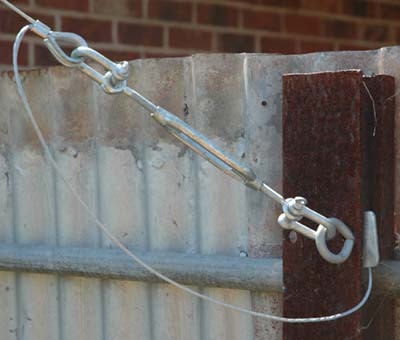 The swage connector in conjunction with galvanised wire rope thimbles, D shackles and adjustable turn buckles creates an effective and adjustable guy wire attachments. Operationally there is no need to climb the tower to carry out work on the antennas. 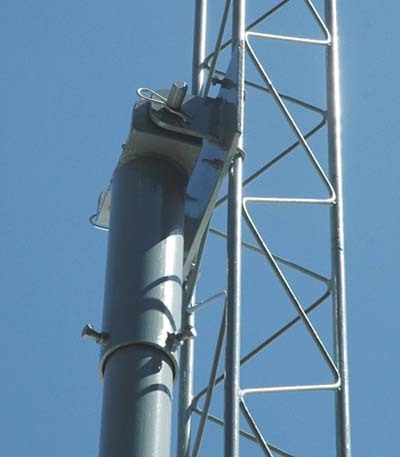 By disconnecting one of the guy wires and un-bolting the tower attachment near the base of the structure the lattice tower which is slightly top heavy can managed easily with ropes and tilts over. The process is a relatively simple one person operation as is reinstating the mast to the up right position. While I quite like climbing radio towers it is clearly safer and easier to carry out antenna work from the ground. The completion this project is not the end; it is the beginning of the real projects. Photo#1 The tower bracket and rod sitting in the cradle assembly and held in place by the weight of the tower. Drg#1 Bracket, rod and cradle assembly. Photo#3 Guy wire rope thimble, D shackle and adjustable turn buckle assembly. Photo#4 Tower in the tilted over position for installation of new 5λ/8 ground plane antenna. Photo#5 Completed tower assembly in the guyed upright position. Wire splicing for terminating an antenna aerial wire or guy wire to a strain insulator or thimble.